Need more storage space or just need to get things organized? 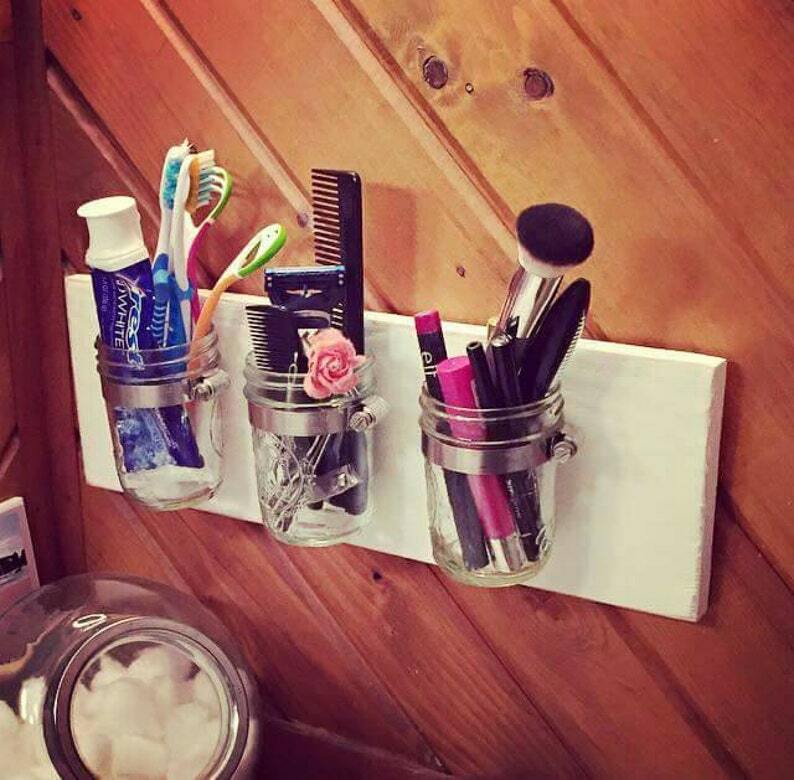 This mason jar organizer is perfect! Measures about 16 in by 4 in and includes 3 mason jars. Comes in any color you choose! International shipping now available. This listing is set up for US shipping only, but I now offer to ship internationally as well. If you would like to place an international order I will tailor a private listing based on your location. Can’t say enough about my custom board game!!!! Rachel was extremely helpful and walked me through this whole process. My completed board is exactly what I was hoping for! I made this for our school auction and I know it is going to go quickly! It is gorgeous! My wife loved this! I got it for her as a gift and she thought it was the coolest thing ever. Rachel was very quick with her responses and making the proofs of the board, plus was fast to get it printed and shipped. The quality of the board itself is perfect, definitely looks professionally made. For custom orders I require payment up front. I do not start working until the order comes through. You can cancel your order for a full refund until I start working on your item. Once I have started working on your item you may still cancel your order for a partial refund (actual amount depends on my progress). There are no returns or refunds once the item has shipped. You can cancel your order for a full refund until I start working on your item. Once I have started working on your item you may still cancel your order for a partial refund (actual amount depends on my progress). There are no returns or refunds once the item has shipped - except for damaged items. This store ships anywhere via USPS. A tracking number will be provided for all orders. Other shipping methods or upgrades may be available upon request and may require additional fees. International shipping now available. Remember, you may be asked to pay any additional customs fees. Buyers are responsible for duties. For custom orders I require payment up front. You can cancel your order for a full refund until I start working on your item. Once I have started working on your item you may still cancel your order for a partial refund (actual amount depends on my progress). There are no returns or refunds once the item has shipped. Before shipping I will send you a picture of the completed product for your review and approval. At this point you are welcome to make any changes. Once the changes are made I will send you a follow up picture for your review and approval. I will not ship the item until your are satisfied. Once I have your okay the item will be shipped. When given your approval on your item I am no longer responsible for errors in customization so be sure to be check every detail before giving your approval. Processing time starts once you have informed me of all your customizations. I obviously cannot start processing until I know exactly what you want.